Thanks for another fantastic post. Wow!!! I suspected that my design is going to mix time periods. The problem I face is that I really like the looks of the early double fullered blades but I am not too fond of the Anthropoid hilts. My collection strategy is to show the development of swords though time with three swords from each major category. If possible I would like one sword to be early in that period, one sword to be late and one in the middle somewhere. So with the Celtic swords I will have an early antenna type sword and a very late Celto-Roman sword like the Hod Hill or Embleton. That leaves alot of room inbetween. In each case I really strive to find a sword which is a decent replica of a particular find. In most cases it works... However, the sword we are discussing may be one of those exceptions where I will probably take some artistic license. Here are some pics. It has a double fuller and seems to be of Early to Middle LaTene... Even if it is late it still is not too far from my LaTene blade in overall geometry. It has a large ring which I am speculating encircled the widest part of the pommel. If so than this would have a large egg shaped pommel on a very beautiful double fullered tapered LaTene blade. I envision the metal ball at the end of the tang would be nested inside the organic pommel. I am trying to make my sword design somewhat of a recreation of this particular sword. Thanks for your input... I am so glad that you're here! First, let me preface this all by saying, Many people seem to be "turned" off by what I see as the Celtic stylism, and many much prefer an ovoid or ball pommel. I also have to say, that with almost all Celtic swords having the organic material gone, it is possible that some had sphere pommels. It's just my opinion on looking at what "evidence" we have that such is not the case and that the ball/sphere pommels came in during later La Tene III. My opinion, so I don't think anyone can tell you definitively that you are flat "wrong" for putting on a sphere pommel, my opinion is that it is less likley and does not fit as well with art styles, etc. But I am kind of getting the idea that you also dislike the double-ball look? If so, maybe a few more options....Again look at Sanz, pg 182. 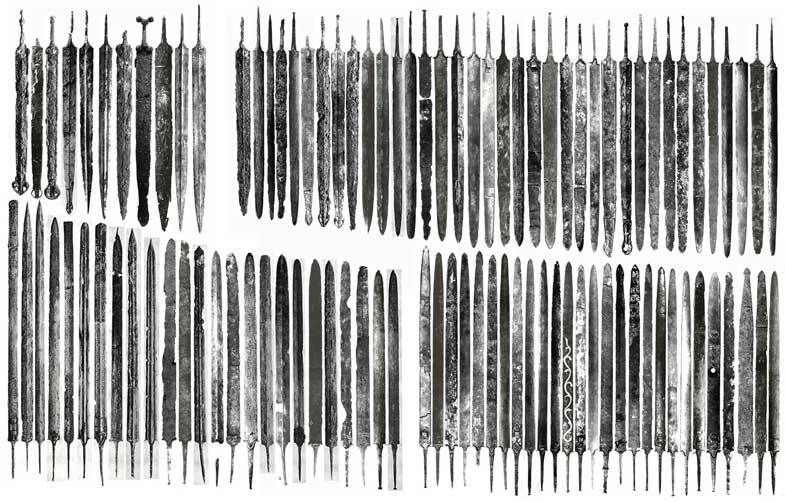 Many iberian sword pommels with sort of a half-sphere pommel, the shape surviving because of the high amount of mettallic componnets. Perhaps this outline shape also could be seen in the La Tene I Celtic pieces....couple reasons for this---1) could be a derivative of the earlier Halstatt mushroom form, but flattened 2) fits with the art style of the period, the Celticized palmate version. Let me explain the latter---the external shape of half-moon would not really dictate the "look", but would be a negative space to hold the design. Look at the Cel;tic palmate on Sanz pg 124, fig 6 and 7. In each of these, the upper portion of the design would fit very well into a half-moon, atrophied mushroom sort of pommel, with perhaps a slight indentation in the upper curve between the trumpet scrolls/tendrils and the middle palmate form....so you have a trilobe that is not so directly anthropomorphic (though still subtly anthropomorphic) but also fits the style of that period celtic art, with a clear link and derivation from earlier Halstatt....Does that make sense??? Or you could go back a bit further, speculatively, and add an organic "disc" pommel reflecting the pommel styles of the bronze age stuff like Urnfield era---this last is quite the stretch, though. Finally, my thoughts on the "great Dane"---that sword from Lindholmgard. A minor bit of rant. This is the sword pictured in Oakeshott a couple places, and by Oakeshott hinting that this is a typical celtic sword, I believe he has done a great diservice to the study of the Celtic weapons. This piece is an oddball. First, it's outside the realm that could really be considered celtic--not really a celtic piece, more like "celtic influenced". Second, I think the 300 BC date is pretty wrong. The blade does have an affinity to some of the Halstatt bronze and iron piecves, but given that, it should have an earlier BC date. It may be that contextual finds trend it toward 300 BC. If this is the case I would be glad to know of them for the dating---this would make the whole piece an interesting convergent development foreshadowing much later styles in La Tene culture. But if they are dating it based on the "celtic" features, it should really look a lot more La tene III, based on those features. As mentioned, it's an oddball piece. Several features on it atypical of celtic swords generally---the scabbard with side rings is very much not the norm for celtic pieces. never seen a 2-piece subcampulate guard on other celtic pieces (one Iron, one bronze) and the bronze is thick to the point of being very like the British pieces or thicker. The ball pommel does show up a couple times throughout the period, but I see more of these appearing in La tene III. Even with that said, this is by far the largest sphere pommel cap I have seen for "celtic" pieces. Noting all that, dating with La Tene analogs: The subcampulate guard is of a form and thickness that points heavily to at least solid middle La Tene II, but likely more La Tene III. The length of the tang in relation to the blade also militates toward La Tene III, based on the ratios presented and explored by both Navarro and Stead. Also the blade form, though somewhat similar to some Halstatt pieces, is very much in good company with late la Tene. From the full on pics I have seen, it is not so very tapered, broad, double-fullered, and long with spatualet point, like a goodly number of La Tene III pieces. I do agree that it is quite likely to have organic material cupping the sphere pommel cap(if we are making it look more La Tene-ish)---I tend to believe that this is the late La tene type of trend that led from earlier trilobate subanthropomorphic form to eventually become the pregnant egg style. However, based upon the features mentioned above, I would suggest the cupping material look more like the Mainz grave market and the Bohemian pommel, in form still somewhat distinct but the outer form is clearly approaching (and influenced by) the ovoid Roman forms. This is my opinion, again only FWIW. Whew, I hope all this was intelligible! Of course, Kirk, if you very torn with indecision as to hilting styles, etc, I can take the blade and hilt it up---just to relieve you of mental strain and pain, of course!!! I think that many of the earliest iron swords with organic components to the hilt also had a more anthropomorphic look. I found an archeological report where the researchers excavated around the carbonized remains of the hilt and then took a plaster cast of it. This gives a rare glimpse into what the geometry of one of these organic hilts may have looked like. The image in the far right is all that would normally be found of such a hilt. The next picture to the right is the two pasts of the plaster casting. finally to the far right is a replica made from the shadowy information gained from the carbonized remains. Is there anybody, who knows to what kind of blade this hilt would be attached?? To what timeperiod could this sword be dated?? Once again, thanks for taking the time to type such an informative post. It is taking me a while to process it. I have tried a few more sketches based upon your suggestions. I also found another view of the "Great Dane" sword (I think) and you are right the blade is not nearly as tapered. I also noticed that from that angle the large pommel ring is more narrow. So it is not circular, but very oblong. Also the picture I have of the Pergamon relief seems to show a more rounded oblong pommel... from what I can see at least. Thanks again for your input... it is very much appreciated. "Great Dane" La Tene Sword from above? I was able to dig though some old xerox copies I had packed away and found an archeological drawings of the Liebau sword. It has a tapered blade with a diamond cross section sporting a very prominent ridge. I keep thinking that it looks as much like the earlier bronze age Halstat as it does the La Tene blades. It does have nice proportions IMO. Would make a nice project. Posted: Thu 20 Jan, 2005 12:31 am Post subject: Realy Great! You guys are realy great!! One day I hope I can be of any use to you guys.. Yes that is the same sword, I keep calling it the Dane because it is not really direct La Tene culture, and such an oddball in several ways, not that it's really nakmed that at all! The Pergamon pic, I am not sure? I am thinking of the Pergamon relief erected by Attalus (sp) in commemoration of victory over the Gauls in Turkey. 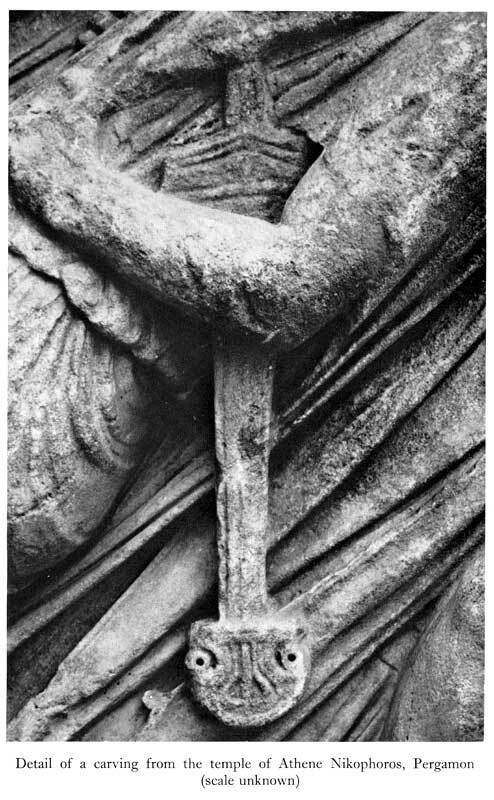 That sculpted sword hilt is pretty clearly two-lobed, this carving is depicted in Sanz on page 242, figure 141, bottom row, second fromt he left. a good ten or so other sources and archaeological drawings in other sources I have draw it roughly the same way. It is depicted as having a grip with grooves in line with the blade, and a distinct horizontal rib separating the grip from both pommel and guatrrd sections (spacers, I wager?). The pommel then has a section that is vertical and ends in a bit of a "nub". there is a distinct rib again on either side of this middle pommel section, which separates out 2 very rounded lobes---looking almost like cartoon "mouse ears". If it's the same one I am thinking, the picture does not accurately reflect the lobed nature of the pommel, it's not really uniform in composition or oblong....wish I had a scanner! That Liebau sword is an odd one. The scabbard and the blade are a-typical of La Tene, though it dates to La Tene one by associtaed finds and the decoration on the scabbard. The scabbard is strange, and the blade shape and taper are not very typical of other La Tene blades, even the narrower ones. I did your PM's, getting back to them after being a week w/o internet. Does anybody know what kinds of steel were used in Pre-Viking Irish swords? Is there any suggestion of pattern-welding in the archaeological records or do we only see monosteel? Short answer is: very crappy iron with lots of inclusions or very poor steel. NO evidence of patternwelding or even piled structure. In short (no pun inttended), the Irish artefacts were way behind the curve of the Continental blades, in terms of metallurgy. For the "long answer" , please see B.G. Scott, Early Irish Ironworking. You should be able to get hold of that pretty readily over there in the UK library stacks, I should think?It's a very indepth metallurgical analysis of Irish iron artefacts, including the EIA swords. I recently discovered an Iron-Age Ireland discussion board (http://groups.yahoo.com/group/Iron-Age-Ireland) that made me wonder. The archaeology is generally described as "inconclusive" (on this site), although the article you referred to is referenced. Interestingly B.G. Scott, (who was also the Head Conservator of the Ulster Museum at the time he wrote "Early Irish Ironworking") had sought permission to do an analysis of the blades associated with the Bann scabbards for his work. He was refused, alas. I suspect you are quite right though-- the continued use of bronze in weapons well into the iron age suggests that Irish steel wasn't the best. I imagine better steel may have been present (even if imported) but until archaeology demonstrates it, as it may yet do with the Alloa find in Scotland, it's just a guess. Ive got a question here. In several works on the celtic sword, it is claimed that the Celts started making laminate, pattern-welded blades around 400BC. I do know that they did make folded / damascus steel blades, and have seen some myself, but haven't seen a laminated blade. To make this statement, at least some blades must have been examined, but I can't find any reference to an actual celtic sword with laminated blade. Somehow, I'm starting to suspect that someone just made up that fact, and everybody's been copying from this ever since. Can someone please enlighten me? Where _are_ the celtic laminated blades? Can someone send me some more information about that Liebau sword? I may have to get a reproduction of that made for my Celtic kit... It'd fit me right fine! Anybody have ant idea why the "great dane" has a tip that is nearly square? That's makes two people planning on doing a "recration" of the Liebau sword. Allthough my name isn't Liebau, I kind a like that sword and right now try to work out de maseurements. Un fortunatly till now i havend found more information on it than "just te pictures, and illu's on this board. So if you com across some more (writen) information please let me know. The tip shape is unsual indeed. Most probably it was not like that from the beginning, but likely had a rounded tip (or maybe parabolic?). The tip may have broken off in action, and then re-shaped to the shape we see now. Because this tip shape is highly unusual and iirc the only sword of this style known to us. The tip shape is unusual indeed. Most probably it was not like that from the beginning, but likely had a rounded tip (or maybe parabolic?). The tip may have broken off in action, and then re-shaped to the shape we see now. Because this tip shape is highly unusual and iirc the only sword of this style known to us. It is amazing to me that you have these absolutely gorgeous blades and then these funky tips. I remember that conversation. I must say that the point being broken is unlikely, though. You fail to take the flat scabbard into account. Do we know if the blade fits tightly into the scabbard? If so, then the owner either took care to make a new scabbard for a broken sword (instead of a new tip for a broken sword!) or else they had a flat sword to begin with! Alltough German is not my native tongue (only two years of education) and English isn't either, I had some fun with a small dictionary Dutch to German (how handy ) and http://babelfish.altavista.com/ and some bigger dictionarys English Dutch and Dutch English. On the tang fits a wooden grip. Of possible other materials such as metal, boon, horn etc. is nothing found. The grip is fastened with three iron rivets (nails). The strong/firm tang, with square cross section is at the end fitted with a bronze button that is drilled thru and riveted. At the upper end of the grip, are two the same, short, somewhat upwards bending wooden arms. These arms are also finished with bronze buttons attached with long iron nails. The other lower and of the grip, has one bell shaped wood construction (of two legs) who are also finished with bronze buttons, attached with long iron nails. All bronze buttons are decorated with three surrounding circles. The blade tapers to a (sharp/acute?) point and has on both sides, up close to the point, a small but strong and proportioned midrib with a half-cross (?) shaped cross section. The other upper end of the blade by the grip, is also bell shaped (like the wooden legs). Some parts of the scabbard are rusted on two this. Parallel two the down going middle sections of these S-shapes. All the (S, C and bladder) shapes are filled in with dots. On the iron back plate of the scabbard is a iron (square shaped cross sectioned) loop riveted with obviously half cross sectioned discs. The inner side of the scabbard has some remainings of wood inside. The bronze has a green patina with adhering rust. The bronze parts are broken and the iron is strongly rusted. The blade and the back side of the scabbard are extremely flaked/bladdered and rusted together. Overall length: 92,9 cm; Hilt: 16,4 cm; the middle part of the hilt: 7,3 cm; cross section tang: 0,7 cm x 0,7 cm up to 0,9 cm x 1,6 cm. Thanks so much for doing this for us. It really helps me see the Liebau in a different light. I was especially interested in how the tang button was riveted. Vladimir Cervenka has used a wedge at the end of the tang along with peening to produce a better purchase on the pommel. He said that he had heard of this technique being used on celtic swords but could not give any particulars. This mention of a rivet through the tang button into the end of the tang (if I am reading it right) is the first evidence I have seen in period swords of driving an object in the end of the tang to widen it and help hold hilt components in place. Have not been back to this thread for some time, but had a few random thoughts, and now an image or two to go with it. Again, collecting reserach material from many regions, I am struck again that many if not most La Tene II had a decent amount of point. The typical middle La Tne celtic sword still typically tapers in the last 1/3 of the blade, just not as dramatically as the Early blades---again all of this is mentioned above. That is why I was so struck by Dr. Parfitt's chronology related to the Mill Hill, Deal sword. Parfitt goes to great lengths stating that the sword seems to be of early La Tene character because of its tapered point. 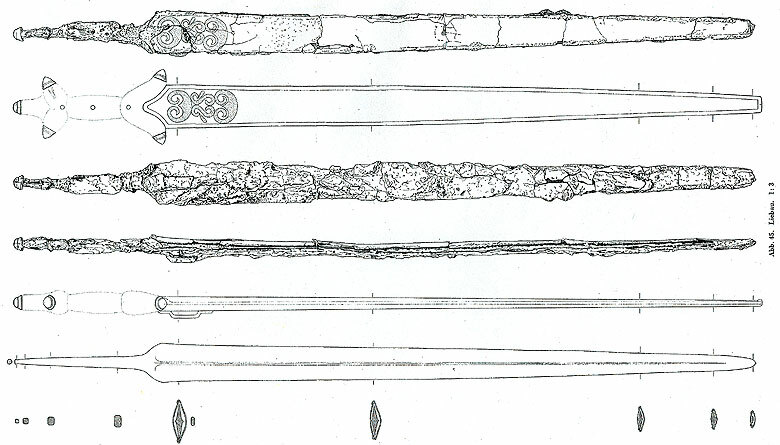 But when compared to a number of very "classic" Middle La Tene swords from the site of La Tene, the Mill Hill sword's profile is typical, and even tapers less than many very "standard" middle La Tene forms. To me the Mill Hill sword in profile and length is aquite clearly and at a glance a Middle La Tene blade.